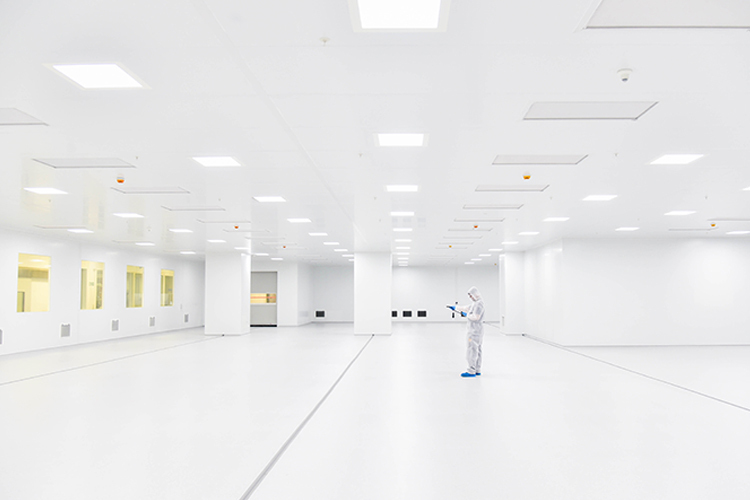 Cleanroom lighting is often an afterthought in cleanroom design, as the primary function of a cleanroom is to reduce contamination. So when identifying the type of light fitting to use, consideration needs to be given not just to the lux levels required for the process, but to how this choice of lighting may affect airflow and filtration. The environment, application and task must be carefully considered, with many choices to make depending on these variables. Arguably the greatest influence when choosing lighting is the ISO classification of the cleanroom. 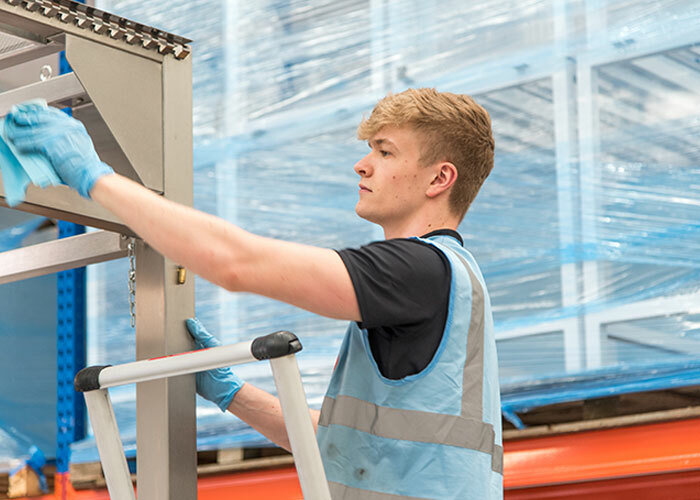 To achieve the stringent levels of cleanliness and air changes required in the higher classes of cleanroom, ceiling space is prioritised for filtration. 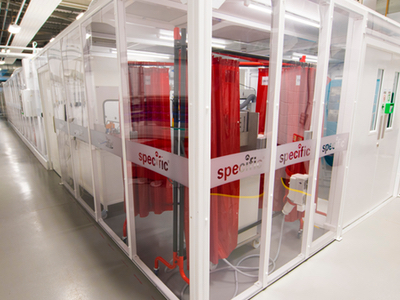 ISO class 5 cleanrooms for instance, may require full ceiling coverage, so space is at a premium. Here LED batten lights are a practical option. The linear shape means that they have an appropriate footprint, which can be surface mounted between HEPA or ULPA filters, providing a good spread of light through the facility. Consider the profile of the fitting - teardrop luminaires are lights are easy to clean and have little or no impact on airflow. For lower classes of cleanroom, there are more options as the ceiling space is at less of a premium. Flat panel LED luminaires integrated into a monobloc ceiling with a flush finish, making them fully cleanable, wipeable and sprayable. When considering the type of lights to be used in the cleanroom design and planning phase, service and maintenance is important. LED has long since replaced fluorescent lighting as the go-to lighting type, as it not only lasts longer, but uses less wattage. So using LED lighting has the double benefit of saving energy and reducing the amount of maintenance required. Roomside replaceable lights will allow the lights to be replaced from inside the cleanroom, which is desirable when space above the roof is limited and maintenance personnel would struggle to gain access. Ideally, if the space is available, roof-side replaceable lights permit servicing and maintenance to be conducted externally, without disrupting the integrity of the cleanroom. If roofside models are in use, they will need to be walkable, so that safety is maintained at all times when maintenance is being performed above the cleanroom. To ensure the facility meets the lux levels required, a lighting simulation can be created in the design phase. Using specialist light planning software, a working plane and the output of lighting can be set. The simulation produced then allows you to check for even coverage of light and identify any dead spots. This allows the light distribution to be tested to ensure it meets requirements. As well as checking that the light levels are high enough, this will also confirm that the lighting has not been over specified. Excessive lighting would mean not only a higher investment than actually needed, but also unnecessary maintenance. Lighting control can be designed to facilitate individual requirements and budgets. The location of the control needs to be considered and each has its own pros and cons. Manual control at the side of a cleanroom has the benefit of gowned operators not having to leave the clean environment to turn on lighting. Piezo switches are effective here as they are durable, can be fully sealed and are low profile so have a reduced capacity to hold dust. Lighting can also be controlled via a cleanroom control system, which can automate lighting with day/night control to suit shift patterns. Automated control via a system with passive infrared sensor (PIR) motion detector can ensure energy is not wasted when a cleanroom is empty, whilst also providing the health and safety reassurance that operators will never be without the required lux levels. 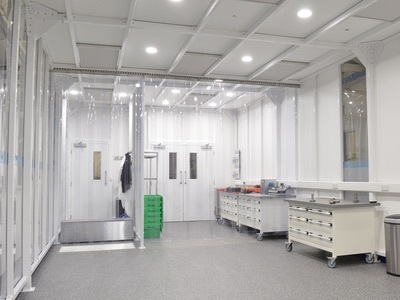 This type of lighting was used at the award-winning Convatec facility (pictured above), created by Connect 2 Cleanrooms. We are seeing lighting trends following suite from advances in home automation, with features such as adaptive light levels for occupancy and the ability to change light output and colour at the flick of a switch, to suit a wide range of applications. Getting the required lux levels right is a crucial step for the safe and effective operation within a controlled environment. 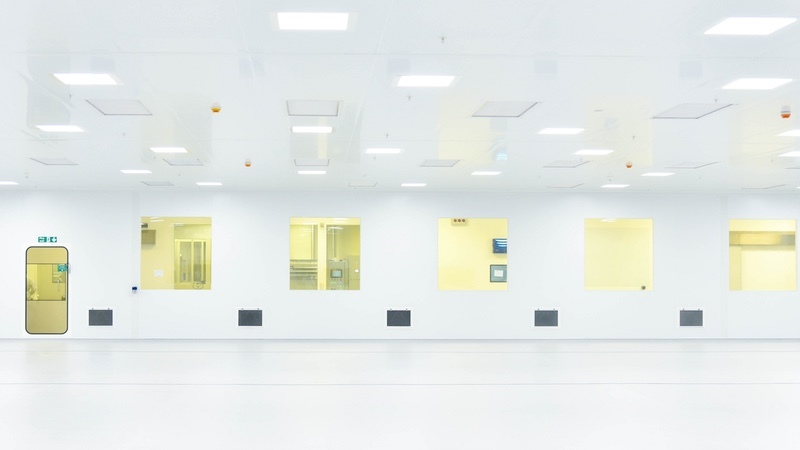 Typically, the minimum lux requirements for a cleanroom are driven by the production of small and sensitive components. The lighting levels then need to be high enough so that processes are properly illuminated. The lux levels required will depend on the task taking place. For example, fine detail work will require 1000 lux at the working plane, whereas general assembly work will only require 500 lux. The Chartered Institute of Building Services Engineers (CIBSE) has a Code for Interior Lighting, which takes into consideration the application then recommends a range of service illuminance in lux. A sample is shown below. 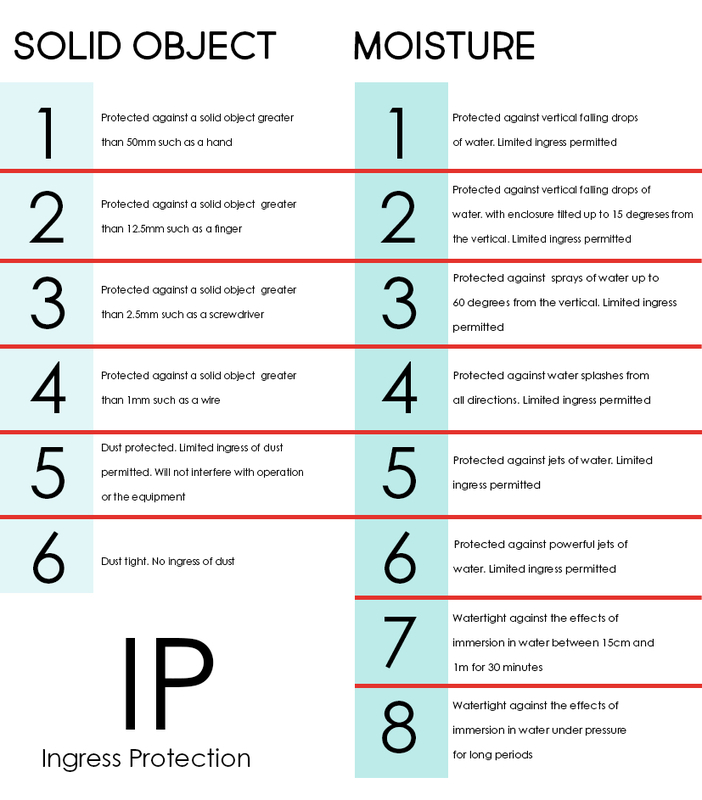 Most cleanrooms may be satisfied with IP45, which means the light is protected against a solid object greater than 1 mm and has protection against jets of liquid. This moisture protection is higher than a general facility, because cleanrooms are cleaned more often so will need to be able to resist cleaning sprays. Others may require the higher rating of IP65, which means units are completely dust-tight allowing no ingress and has protection against jets of fluid. As always, companies should risk assess depending on their task and application. The colour of lighting is determined by its Kelvin rating, which represents the colour temperature. Considerations should be given to the task. 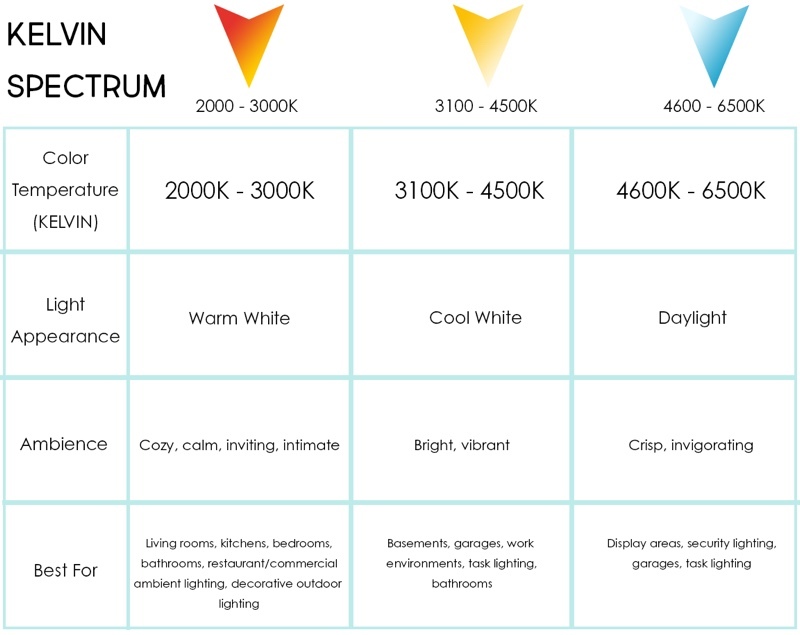 The Kelvin rating spectrum starts at warm white (2000-3000 K) and goes up through cool white (3100-4500 K), to daylight (4600-6500 K). Task lighting tends to require either cool white or daylight, however it is important not to over spec brightness, as if environments are too bright, this could lead to visual fatigue in workers. Consideration should also be given to the facility that houses the cleanroom. Facilities often prefer to match the colour, as it creates continuity for people walking in between spaces. 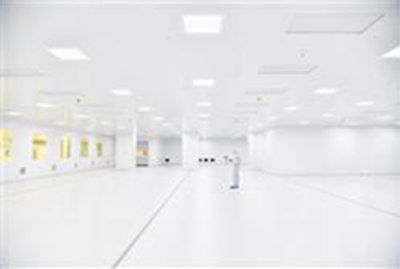 Although LED is often used for general lighting, UV lighting has some specific task-orientated applications in cleanroom lighting. In the process known as UV disinfection, germicidal UV light can kill bacteria, yeasts and fungi quickly and without the need for any harsh cleaning chemicals – benefiting both budget and the environment. This comes with H&S considerations however as this light can be harmful to operatives. UV torches are also a fantastic training aid for operatives, using UV gel and powder to highlight the dangers of cross contamination, improving adherence to hand hygiene and cleaning protocols. UV lamps are a popular choice for inspection work, as the luminosity created can easily detect contamination. Articulated arms on these lamps can allow control to accommodate a working range to satisfy a variety of products. Care needs to be given to the size of the task area, as DIN EN 12464-1 requires “the right task lighting in the right place,” taking into account the surrounding area too.